The BLINK4 bike light set will get you on the road in seconds with noticeable brightness at the lowest price. Each pair is powered by 2x CR2032 Lithium batteries (included) to give you run-times of up to 50 hours to keep you riding safer and longer, never worrying about having to recharge your batteries every time. 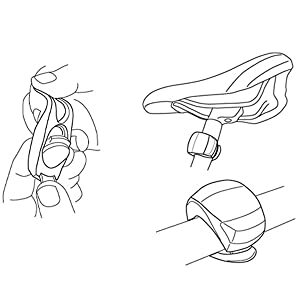 The silicone strap allows for an easy fit on almost all bicycle handlebars and seat posts. Wear or strap it on your hat, backpack, stroller, or anything you can think of. This package includes two sets of front and rear lights so give a set to your friend or family and enjoy the outdoors safely today. Stretch off the rubber from the inside and you will see the cap that twists off to replace the battery. The silicon is covering the battery. Take out the silicon covering to expose the battery.